Historic home built in 1885 — Evanston, Ill.
What’s the most daunting task about painting your vintage home? Color –what colors would fit best with the character of your home and your personal preferences. Easier said than done, right? With so many paint colors available today, choosing which colors work best with each other is a challenge. Considering the exterior of your house is not an easy or equitable “do-over” (unlike that chartreuse color you thought would look so great in the upstairs bath), finding the perfect outside color combo can be more than overwhelming. When choosing exterior colors, it’s important to note that some color schemes can intensify the look of an older house while others can make that same home look dull on one side of the spectrum, or even outrageous, on the opposite end. Monochromatic color schemes offer a sophisticated look. A light brown siding with dark brown trim and shutters will provide a sleek, uniform look. If you want something a bit more eye catching, consider a complementary scheme of colors that have a huge amount of color contrast like violet and yellow. Yellow-orange or red-violet colors fall within a triadic color scheme. When you work with a triadic scheme, select colors that are equally distant on the color wheel. Just the opposite of a triadic scheme is an adjacent scheme, achieved by using color options that are next to each other on the color wheel. A good example of this would be violet, blue-violet and blue. Historical Appropriateness – Research is basic in this category to investigating the color palettes that were available and favored during the time your house was built. The further back in time you go, the fewer colors there are to choose from. Historical Color Collections can give you a hand in your paint color selection. One solution to finding the original colors that most likely would have been used for your home is to do an online search for “historic color charts”. Exterior paint colors for very old homes usually mirrored the material colors of the day like brick, copper, bronze, and exposed timbers. Refine your color options even further by searching for your home’s design style (i.e., Craftsman, Queen Anne, Colonial Revival, etc.). 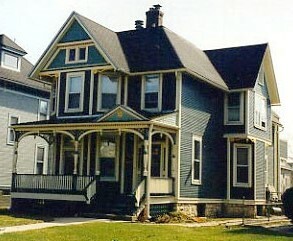 Many home designs had their own unique range of color pallets. Another option for finding colors used during certain time periods may also be found in old print, such as colors used on postcards, sheet music, in advertising and other like items. Historical Accuracy – In choosing this category you will strictly limit yourself to the original colors used on your home. This could prove more difficult to match, depending upon the age and/or uniqueness of your vintage home. Old color photos (if available) may help, as would talking to long time neighborhood residents – again, completely dependent upon the age of your home, and your neighbors. Ultimately, using a scraper to peel back the layers of paint to find the original true color of your home is the best method. Make sure you do this test on all the aspects of your home, as multiple colors can be hidden between the various areas of the body and trim. If you do decide to uncover the old paint, it will most likely be faded. Bring a scraped sample to a paint retailer or professional service provider with vintage home experience for help in matching today’s shades with yesterday’s colors. When you adore the history of your house but are not married to preserving its historical accuracy, work with your personal color preferences and build from there. Exercise your tastes, keep the vibe of your neighborhood in mind and take care in choosing colors you can live with for years to come. 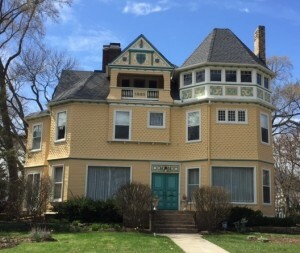 This entry was posted in Chicago, Historic Landmark, Home Renovation, Painting, Restoration and tagged Chicago, Chicago Suburbs, Evanston, Fortune Restoration, Paint Color, Paint Contractors, Painting, Vintage Home on May 26, 2015 by admin.